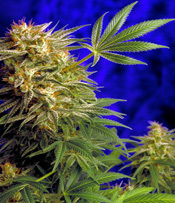 Growing: Â Moderate This indica dominant hybrid marijuana strain is the result of a double backcrossing of a Sensi Star female and Sensi Star male. Â The result is a cannabis strain that has special characteristics and can be grown especially in an indoor type of growing set-up. Â Beginners who have basic indoor growing knowledge will find this strain n ideal weed to grow.Flowering time for this mostly indica hybrid can be expected Â once it reaches 8 weeks in an indoor growing system and it can be expected to grow buds that are dense with lots of THC crystals as well as resin. Â It gives a pretty high yield of up to 500 grams/m2 which is excellent compared t its relatively medium built. Â This strain will emit a super pungent scent that can fill the grow room and this will be carried to a sweet lemon taste when smoked. Â The effect when smoked is a mixture of mind and body uplifting mix that is energizing and clearheaded. Iâ€™ve seen and tasted a number of indica varieties but Super Star weed is a kind of its own.Â I thought that only sativa dominated strains can provide uplifting high but I guess I was wrong cos this here is just amazing.